Welcome to The Aspens, Whistler's premier ski in, ski out property. Conveniently located, right on the slopes, near the base of Blackcomb mountain, this is a top-floor, newly renovated and upgraded suite with stunning mountain views. Please see the Gallery link above. You are just moments away from the Wizard chair giving you speedy access to Blackcomb mountain and its diverse terrain. Perhaps later, take the Peak 2 Peak gondola and explore Whistler's hidden delights. Grab a bite on the hill at one of the excellent dining facilities or take advantage of your ski in, ski out accommodation to have a relaxing lunch at home. A short stroll takes you to the heart of Whistler village with its buzzing aprés and great shopping. Or have a quiet night in with home-cooked food and a glass of good wine. The condo has FREE wireless internet, air-conditioning for the summer months and anti-allergy bedding. Please use the navigation links above and below to get further details and be sure to check our rental Policies to confirm they meet your needs. When you're ready to make a booking, click the Reserve Now link above. If you have any questions, don't hesitate to use the Contact link at the top. NB: Not all apartments in The Aspens have been upgraded. 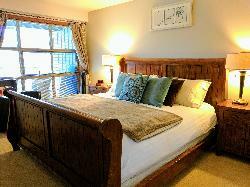 Compare our Photo Gallery with the others to see the quality of accommodation you are reserving. Get the best value Lift Tickets! Book our condo to qualify for discounts of up to 18% - more if you book early - off the window price for tickets. Make your booking using the Reserve Now link above then click here to purchase discounted tickets from our affiliate, allura direct. Enter 28 for the property ID when ordering your tickets. Looking for lessons? We have the perfect guy for you! One of Whistler's top-rated ski instructors who will work at your pace to achieve your goals. Better book soon though - his popularity exceeds his availability! This is your "Go To" guy for ski instruction. Make a lodging reservation with us and we'll put you in touch.